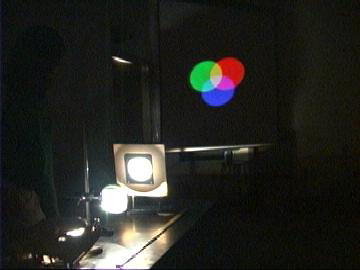 Description: This demonstration shows the addition of the primary colors (red, green, and blue). Aim the slide projector at the primary colors apparatus. You may have to prop it up with a book. Insert a lense in between to focus the light. When finished, turn the slide projector to fan only mode. Wait a few minutes for it to cool off. Turn on the slide projector. Note the addition of the three primary colors (see picture). 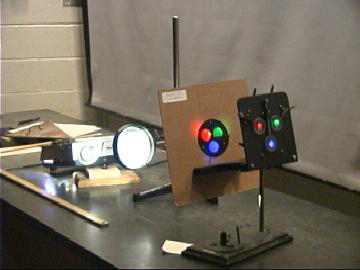 When finished, turn the slide projector to fan only mode. When the exhaust air is cool, turn off the slide projector.